The career of Dagoba has been one of continuous progression. Starting out as an immature, nihilistic extreme metal band with a ton of potential in 2000, Dagoba have worked up and tweaked their industrialized and groovy metal sound into so much more over the last decade. What Hell Is About, released in 2006, was already a huge, dominant leap forward for the band and it has been all uphill from there on. Face The Colossus expanded on the scarce melodic moments of its predecessor to impressive results, with the album shining as a melodic yet powerful metal record which sacrificed none of the vulgar power of its predecessor but brought forth a whole new side of the band. Poseidon, on its turn, took the rugged punch of What Hell Is About and combined it with Face The Colossus’ melodicism, adding an entertainingly raunchy pirate theme to it. Said record strung together all the different ideas the band had toyed around with over their then 10 year career into an impressive display of extreme metal with a melodic side to it, but the best was (and from today’s perspective probably is as well) yet to come. Post Mortem Nihil Est is a whole new beast which leaves Poseidon in its rear-view mirror in no time. Not only is it Dagoba’s best record, it represents a new chapter in their story. In chapter one the band forged an identity and became a force to be reckoned with; in chapter two that is spearheaded by Post Mortem Nihil Est, everything is possible for these French metallers. 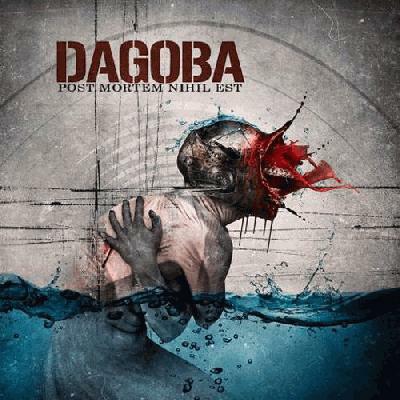 On Post Mortem Nihil Est, Dagoba still play extreme metal which encompasses cinematic melodies, walloping guitar grooves, pounding drums and large soundscapes, but everything’s been kicked up a notch. Again. The production is huge, the songwriting on offer is Dagoba’s most diverse yet, the guitar work is more varied than ever, the album is exceptionally consistent, and Shawter puts forth his most balanced vocal effort by far. Even if Dagoba aren’t reinventing the wheel here, they have put out an album that is equally crushing, groovy, melodic, accessible, and even features progressive tendencies. Heavy verses that are coupled with melodic choruses are the rule more often than an exception in modern metal, but the way Dagoba execute their sound leaves most of their peers to shame. Also, the different guitar effects sprinkled around on each track aid greatly in keeping things fresh and each song on Post Mortem Nihil Est has more to offer than just aggressive verses and a catchy chorus (a clever expansion of the original idea here, a change-of-pace outro there etc.). The flow of the record is impeccable and while "polished" isn’t a flattering word most of the time when metal music is concerned, Post Mortem Nihil Est sounds polished in the best way possible. It’s like a freshly polished muscle car inviting you to take it for a spin, rather than a set of polished nails on a dubiously male looking female. Polished doesn’t mean that the band has lost its aggression and "edge," of course (without their aggression Dagoba wouldn’t be Dagoba anymore); it only means Dagoba have worked out the kinks of past records, the production is more balanced than it has ever been, and Post Mortem Nihil Est is the band’s most complete record thus far. Opening track "When Winter..." starts off with a subtle piano intro, but quickly launches into all-out mayhem after vocalist Shawter sets a course for the album with his grizzly death scream. The song mellows in its chorus, but immensely talented drummer Franky Costanza and new axeman Z make sure the track always has enough bite to it. "I, Reptile" is the album’s most straightforward demolisher with its massive beatdown riffs and relentless drums. "Yes We Die" boasts infectious groove riffs which are some of the band’s most memorable yet, while lead-single "The Great Wonder" is the obvious commercial hit with its lighter, rock 'n' roll tone and memorable chorus. The two closers are also highlights, as Franky Costanza instigates a furious explosion halfway through "Oblivion Is For The Living," and "By The Sword" is the band’s most accomplished closer yet with a massive apocalyptic soundscape forged by whirlwind guitars, surround sound drumming, Shawter’s prophetic vocals and forceful choir chants. One could say Post Mortem Nihil Est is the album the band has been trying to make their whole career, but knowing Dagoba they won’t stop here. From album to album these French metallers have constantly improved and added new elements into their groovy, industrialized extreme metal formula and I don’t see any reason why that should change in the future. Not only are they quite possibly the best band playing such a style at the moment, but god knows what the future holds for this hard-working quartet. Post Mortem Nihil Est is the band’s finest and most consistent outing by far, and that is saying a lot, seeing as how Dagoba have been putting out high-quality records ever since 2006 (2003’s self-titled debut saw a band that was still very much a work in progress). Interestingly enough though, Post Mortem Nihil Est isn’t an overly complex album. Costanza’s drumming is very technical and there are a lot of cool guitar effects on show, but there is still a decent amount of room for experimentation in the band’s sound – room Dagoba are sure to fill with their next efforts. If they manage to be this impressive while staying true to known formulas, we can only imagine what heights Dagoba may reach if they start pushing the envelope. The future is wide open and judging by Post Mortem Nihil Est, these guys are moving in the best direction possible. I don't really think this is a metal album Sputnik can more or less collectively get behind, but I absolutely love these guys and I appreciate their constant development. Never heard of these guys before. The songs sound good though. Glad you enjoyed this Greybeard! Still can't decide what to put on this, but I know it's a 4 at least. "05. - Kiss Me Kraken"
"I don't really think this is a metal album Sputnik can more or less collectively get behind"
It's so bad that I can't hate it. And bloc, you know me and you are right, this really is the epitome of metal I can listen to on any given day of the week. Haha I knew you would be the one to write a review for this, Magnus. A 4.7? Damn! I loved both Collossus and Poseidon so I will listen to this hard. I will also read your review as soon as I get home. Thanks man, if you loved Colossus and Poseidon then I'm sure you'll also love this. Fantastic review, Magnus. Can't wait to hear this. I heard all the tracks you linked and I love them all. Ever since Face the Collossus, Dagoba's album covers have also been kinda awesome. If it was "The Great Wonder" then know that the rest of the album has a completely different tone to it. And imo this is their most complete album, so there's that. Thanks man, you're bound to love everything else as well then. Regarding cover art, well, it's interesting, but unlike with the rest of Dagoba's album covers, I have a hard time figuring out what kind of a symbolic meaning this one carries haha. The album doesn't really have a super-cohesive concept like Poseidon or Face The Colossus did either, though, so I guess it was harder to come up with a clever cover for this one. Woah, really? I'm not expecting much out of this... liked Hell and Colossus but wasn't too big on the last one. Yeah the guitarist changed but it seems it's for the better because this album is more interesting in the guitar department than the last one. If you liked Hell and Colossus then I see no reason why you wouldn't like this. Haven't read the review yet, but "When Winter" is certainly a fun time. Edit: The cleans sealed it, going to have to get this.